Obviously I’m getting addicted to this home preserving business. Case in point, this Pear-Rhubarb Butter. Flashback to last week. It's a chilly afternoon and I’ve got a million things to do. Both boys are napping and so after a few Tweets, I get cracking on the tasks at hand: folding laundry, answering emails, getting a leg of lamb in the oven—and cooking up some pears. Having sat way too long in the crisper, the pears are on the verge of going bad. The plan is to throw them in a pot and cook them down for a sauce for little Mateo. Lo and behold, an hour and a half later, I’m sterilizing jars because I’ve got a totally divine pear & rhubarb butter that has been sweetened with honey and perfumed with green cardamom and I’ve GOT to can it. I absolutely have to put away a few jars for the winter; the housework can wait. So crossing my fingers in hopes that the boys don’t wake up, I hastily can up a half a dozen jars, scrape the pot clean with a spatula and eat it. How did I get so sidetracked that day? It started innocently enough as a small over-ripe pear puree project. Upon discovering that it was way, way too sweet, my wheels started turning and ideas for jam started sprouting entirely on their own. I spied some frozen chopped rhubarb in the freezer and tossed that in the pot. There was no looking back as I added a few dollops of honey and some freshly ground green cardamom seeds. Soon the house was filled with the most intoxicating aroma as what I can easily classify as the best fruit butter of my life bubbled away on the stove. It seems like the best jams just evolve. This butter is complex; there is layer after layer of flavor when it hits the palate, and the fact that it is it is both tart and sweet makes for a whole lot of happy in the mouth. I only got five jars and I'm keeping them all. I'm selfish enough that I didn't even consider bringing them to my recent jam & jelly swap with friends. Sorry people! 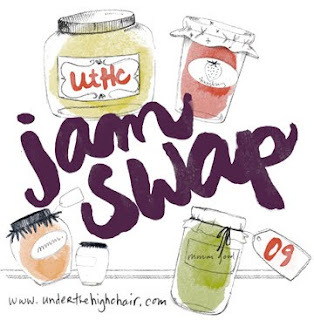 Speaking of swaps... this is my contribution to Under the High Chair's very own Virtual Jam Swap 2009! 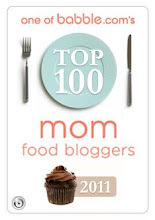 Submissions for this blogging event are now closed. Look for the full round-up this week with over 25 submissions from participants from around the globe! Now onto the recipe. If you're looking for a sugar-free, no commercial pectin spread, this is the fruit butter for you! Note: If this is your first time canning, you may want to read my post An Introduction to Making Jam on Simple Mom. 6 cups chopped rhubarb, fresh or frozen. Cook on low for about 2hours, stirring often. Butter will thicken and coat the back of a spoon. Taste for desired sweetness and either can now, or continue to cook to desired consistency. Meanwhile, prepare to can the butter. Bring a large pot of water to a simmer. Sterilize 6 250ml jars and screw lids by placing them in the dishwasher and running a cycle or boiling them in the pot of hot water for ten minutes. Keep the metal lids in hot water until ready to use. Ladle the pear butter into hot jars, place a metal lid on the jar and screw the ring on tightly. Repeat with remaining jars. When all the jars have been filled, lower them one by one into the pot of hot water. Water should cover the jars. Bring water to a boil and boil rapidly for 10 minutes. Working carefully, using a jar lifter, remove jars from water and place on a clean dry towel. Allow to sit undisturbed for 24 hours. Store in a cool place for 6-12 months, but I doubt it will last that long! This look wonderful! Another use for my abundance of rhubarb. Yea!! That looks really delicious. the perfect companion for a biscuit! I saw rhubarb? In November? Then I realized you're a freezer after my own heart! 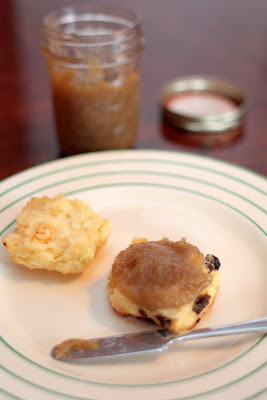 I made crockpot apple butter this year, but I do believe I'd love pear butter even more. I can only imagine the layers of flavor; sweet notes, warm notes, sweet notes, tart notes, yummy notes! 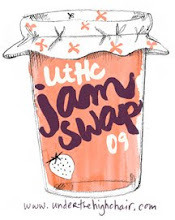 Can't wait to see the outcome of this years jam swap. This looks fantastic, but I was really hoping to try the pumpkin apple butter recipe you mentioned in a recent post. I believe you said you would share the recipe at some point? Did I miss it? Thanks!! Mmm, sounds delightful! I love cardamom. Oh yeah...I have always loved fruit butters, but only recently have started making them. The combination of sweet and tart and the exotic cardamon just sounds like it would be soooo good! Wonderful recipe! Oh, I love the combination of the pear and the rhubarb. I wouldn't have thought of that but I think they must work nicely together. Great idea! Hi Aimee! Thanks to your post about making jam--we actually tried making our own! We made a few jars of blackberry jam, then we tried making batches of apple sauce-and then our favourite raspberry jam! I was so surprised at how well they came out--and how easy it really was! 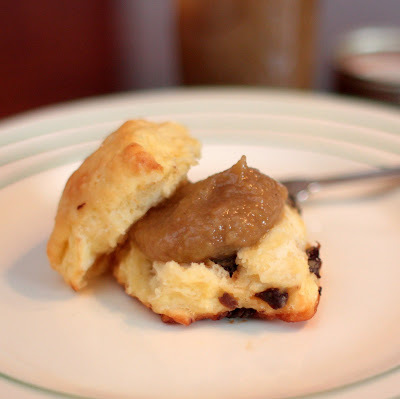 To add to our achievements we made Mincemeat for our Christmas Mince Pies (we're in the UK)! We are all looking forward to those! I'm going to love this on scones! I was hoping you would share this... I've been keeping an eye out for a deal on pears so I can make this. Love the flavour combo. If you notice a box go missing during the move, don't check in Calgary. I have an abundance of pears in my fruit bowl and I've been wondering what to do with them ... now I know. Thank you!! Yeah that lemon blueberry preserve is making me drool. I vow to learn how to make jam / start canning within a year, it's all too good just to look at. Thanks for opening my eyes!! This butter sounds really really good.